This is a page where polydactyl cat breeders can tell about themselves. So if you are ready for the tapping of small toes (lots and lots of toes...), check out the breeders in this page. 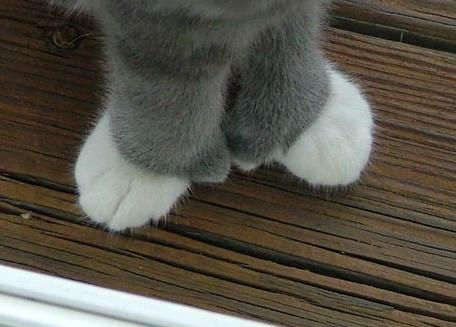 A polydactyl cat is a healthy cat with more toes than usual. This makes their paws adorably big - and polydactyl cat owners swear these cats are more intelligent than other cats, and that their character is more laid back and relaxed than that of many other cats. Well, polydactyls can basically be of any breed, so of course the characters of each cat can vary. Remember that a responsible cat breeder has the kittens best interest in mind. You should not take a kitten that is under 12 weeks of age - its socializing is not ready, if it is younger (in other words it does not know how to behave like a cat yet). Your cat should be vaccinated, and the cats given plenty of chance to get acquainted with people. Also, never buy a "twisty cat" (check the Polydactyl cat page for more information). I shall put the breeders in alphabetical order by location here. If you are a responsible Polydactyl cat breered, fill in the form below and tell about your cattery. You shall be building a page for yourself, which will have a permanent website address. You can add up to four photos and a video too (send the link in the form). Remember to put up your location, and contact information too. If you have a website, write the address and I shall make the link "live" so when it is clicked, it will take the reader straight to your website. Are You a Responsible Polydactyl Breeder? If you are a responsible polydactyl breeder, tell us where people can find you.